Leading three groups of happy and enthusiastic photographers around my favorite corners of Alaska over a span of three weeks was really a pleasure for me, and it makes me feel thankful that I am able to do this for a living. All of the groups had plenty of opportunities to make superb images as these trips were made during the very best time of the year. Its very rewarding to see the images that my participants were able to create. One of the tour highlights was that I co-led the last trip with Arthur Morris (take a look at his blog: http://www.birdsasart-blog.com/). Thankfully I was able to place my group in just the right safe position to see these two adult bears spar for quite a long time. We were able to photograph some amazing interaction between these two. Hallo Bay, Katmai NP, Alaska. NIKON D300s and AF-S Nikkor 500mm f/4G ED VR lens + TC-14E 1.4x II, 1/1250 sec at F5.6, manual metering on zero, ISO 800. Image Copyright 2011 Robert OToole Photography. The range and amount of action that we were able to see and photograph was astounding. 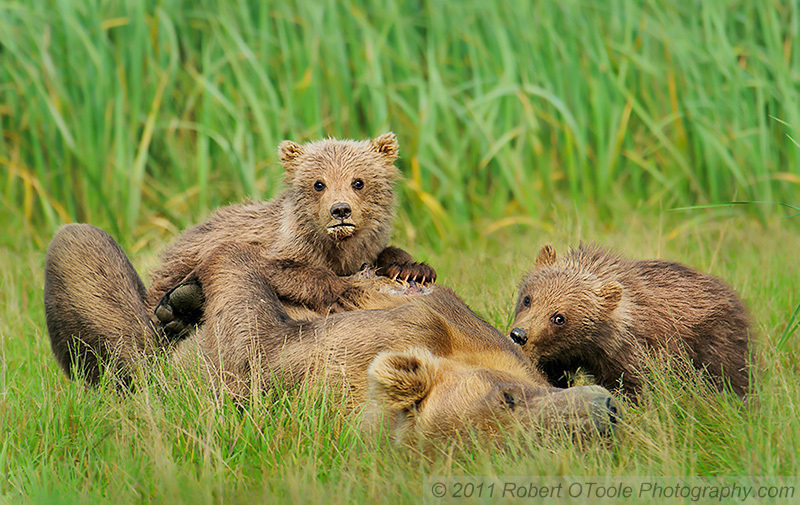 Spring cubs nursing (see the first image below) and a second year cub attacking an adult bear (with mother there for back up) over a freshly caught salmon, more than once! Adult bears sparring was always very interesting and an amazing experience to be able to photograph. We even had close ups of a recently mated sea otter pair feeding (the male will steal food from the female), grooming, and playing. Some of our people in out group had some lucky beach-combing finds. I feel the luckiest finding a sperm whale tooth! I will post more info on that story here next week. The experience of photographing these two tiny cubs nursing made our day. Bright white at birth the collars still visible on these two spring cubs. Kukak Bay, Katmai NP, Alaska. . NIKON D300s and AF-S Nikkor 500mm f/4G ED VR lens + TC-14E 1.4x II, 1/500 sec at F5.6, manual metering on zero, ISO 450. Image Copyright 2011 Robert OToole Photography. This was an amazing tour series from start to finish and it was hard to leave but I am already looking forward to next July! One of the main reasons we are so successful is timing and experience. My trips are planned around the action, weather and tides to maximize our opportunities to make great images. If you have ever wanted to join us now is the time to act. One of the two 2012 trips is already sold out so please let me know as soon as you can that you would like to join me in 2012 so you wont be disappointed. If you cannot make it next summer I have confirmed 2013 dates so let me know if you want to join us, you won't regret it. My friend Jana Bogdanova on her first trip to Alaska. This is one my favorite places on earth. 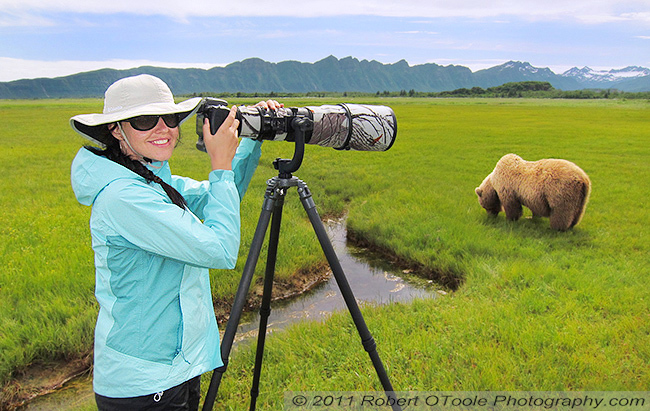 Hallo Bay, Katmai NP, Alaska, Canon PowerShot S95 at 6mm, 1/1003 sec at F5.6, Aperture Priority, flash, ISO 200. Image Copyright 2011 Robert OToole Photography. During July and August you can expect to see the pinks (above) and chum running and bears fishing. 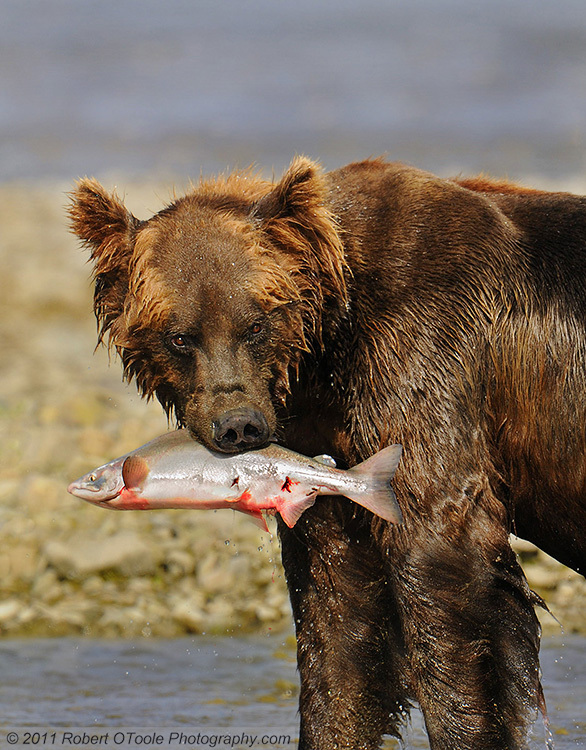 Usually a bear will stop and scan for other bears before eating his catch. Kukak Bay, Katmai NP, Alaska. NIKON D300s and AF-S Nikkor 500mm f/4G ED VR lens + TC-14E 1.4x II, 1/1250 sec at F5.6, manual metering on zero, ISO 250. Image Copyright 2011 Robert OToole Photography.